I obsess about so many beauty products but i'm really in love with this palette! 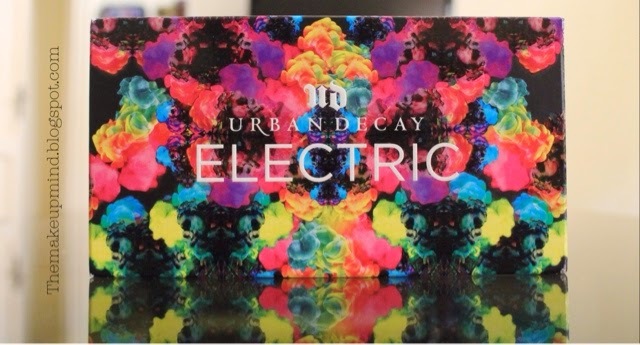 The UD Electric palette came out early this year. Apparently, Urban Decay lovers were getting tired of the naked palettes which comprised of only neutral colours. 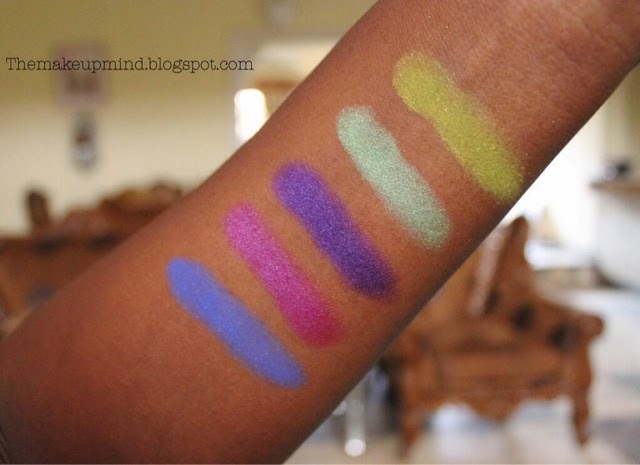 So, urban decay decided to feed us colour lovers with this palette and satisfy our colour craving. Basically, this is supposed to be a go-to palette for anyone that needs a touch of colour to any makeup look. I raise my hat to Urban Decay for their exceptional packaging on this palette. It's so colourful and attractive. It looks like a bomb of colours exploded and created a beautiful painting on a canvas. The palette itself is quite bulky but very sturdy and strong. It has fallen a few times and none of my eye shadows broke. So, it's obvious they made sure the shadows were protected. The palette comes with a wide and very good quality mirror. It also comes with a double ended brush with purple bristles which I think is very cute. This palette contains a total of 10 different and colourful pressed pigments. 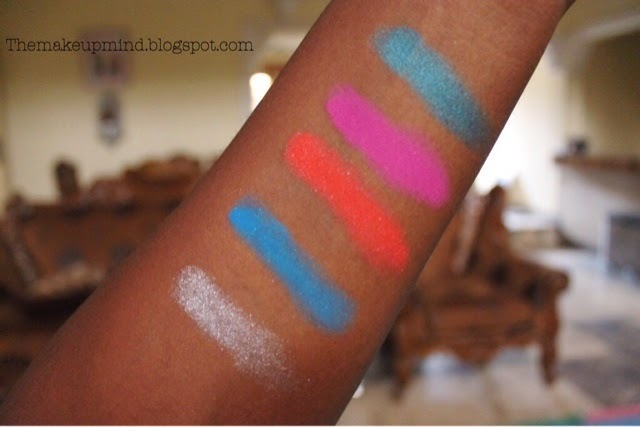 I love the texture of these eye shadows they are soft and very smooth. The only one that seemed a bit powdery is savage (the fuschia pink). The major reason I bought this palette is because of the colour 'fringe'. I was immediately drawn to it the moment the palette was relesed. 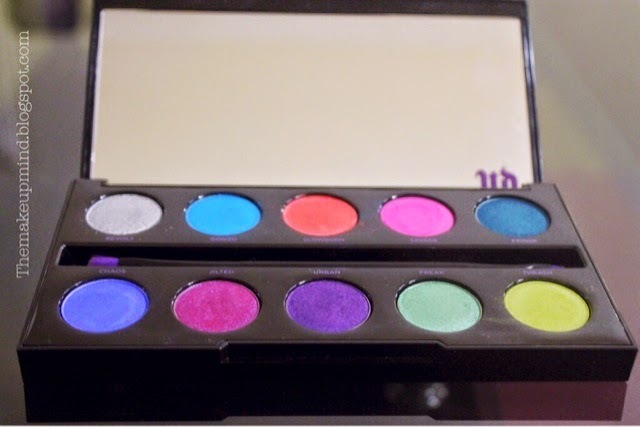 After getting the palette, i fell in love with 'urban' and now, i'm completely head over heels for 'chaos' which is originally from the UD vice 1 paltte and has been brought back due to popular demand. One negative thing I found in the palette is that it is dominated by blue shades (Chaos, Gonzo and Fringe). I believe that if you're going to have a palette of just 10 eye shadows, then you shouldn't create 3 blue shades. In my opinion, Gonzo is the least flattering shade so that shouldn't have made the cut. Another thing about the eye shadows is that they are so pigmented that they leave behind a stain on your your skin even after cleaning it off. But I always wear a primer or base with them so it never leaves a stain on me. 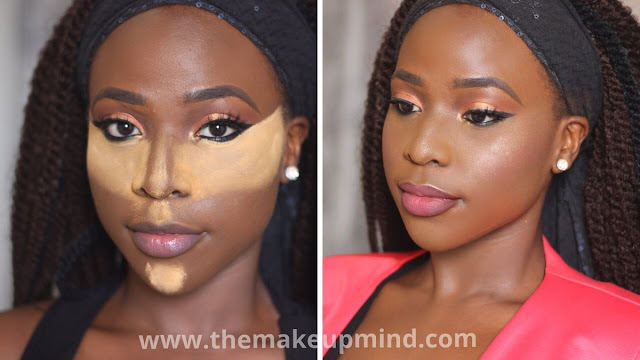 So, if you're going to wear them, it's advisable to wear your shadows with a primer or a base. I'm acually very excited about this palette and reach for it more times than I thought I would. It makes me feel adventurous. It also makes me very creative with my eye shadow application and I don't regret purchasing this at all.